Last weekend we sent Charlotte to celebrate the opening of Nottingham's newest Ice Cream Parlour for some Italian Gelato at Dolcino. 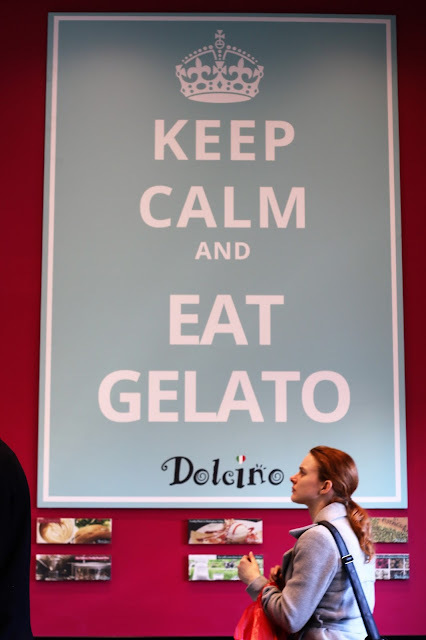 First walking into Dolcino you immediately notice the large array of ice cream in all different colours: there’s Mars Bar Magic, Black Forest Gateaux and Toffee Popcorn to name just a few. It took us over 5 minutes to actually decide what flavours we were going to go for, but thankfully a friendly member of staff came to the rescue. She provided tasters of any we were intrigued by before we finally settled on pistachio and banana – both with generous servings of course. Plenty of Ice Cream to choose from. Wandering around the café to find a seat, we took in the bright, cheerful surroundings with all the little personal touches. A bicycles were mounted on the walls that belonged to the owners, as was a portrait of the owner’s grandad – a reminder to them to create only the best gelato, and giving the place a family feel with a touch of Italy. Being late arrivals to their opening day gave us the opportunity to get a one-on-one tour with the owner Francesco Arcadio. He gave us an in-depth demonstration of how they make their gelato. He highlighted how gelato is different from regular ice cream – a more natural and luxurious alternative to the popular dessert. Proud of their reliance on high quality local ingredients – from their milk to each of the individual components, they provide the gelato with its unique flavour. All of these are natural, and thanks also to the methods they use, result in a healthier ice cream with less fat and a fuller flavour. Wandering upstairs presented us with a quieter and more open sitting area with a fantastic view of the centre of Nottingham. A wall-to-wall window opened out to Market Square and the Town Hall. The other big attraction here is the factory viewing area visible to the public. You can sit here and watch the ice cream being produced right there on site – it’s a really nice addition. Returning downstairs we decided to try something on the menu. Before we got to the till though, the cocktail bar caught our eye and we were greeted by Philip Rundlett who represented the drinks and syrup selections they have on offer from the Italian company Toschi. We’ve never seen such a selection of different syrups and flavours, from kiwi to blood orange. It was clear we needed to sample some of these! First stop was a drop of Nocello in our freshly made latte, which in our opinion gave it a great extra flavour without tasting of alcohol. After swift consumption of this, it was time for cocktails. As we couldn’t decide, our host made us a fantastic custom drink to suit our tastes – somewhere in between a mojito and a strawberry daiquiri. We decided on an American Blueberry crepe featuring more of the delicious gelato on top as a welcome alternative to whipped cream. A wise choice! Taking a seat downstairs with our cocktails in hand our crepe arrived in no time. Philip came over and supplied us with a glass of Fragoli wine to enhance the blueberry flavour. It wasn’t long before we had finished every last bit, despite it being a very generous portion. More than enough for one, it had ample fresh blueberries, plenty of gelato and featured a refined, light texture, just as a crepe should be without being overly sweet. To finish off the evening, we asked to try some of the freshly roasted organic coffee beans, in our opinion best tried in an espresso. The coffee was smooth and silky, and provided a nice finish to our desert. It's safe to say we will definitely be returning to sample more of their homemade gelato and coffee. We feel this café bar is a great place to go anytime of the day - from a morning coffee and fresh pastry to a lunch time break meet for coffee and food, to an afternoon treat with the family. However, we love the fact that we can have desert and cocktails all in one place on a weekend evening, to relax and take away the stresses of the week, a great new addition to the young and vibrant Nottingham.